Erica Giovanni Baez focuses her practice on family law, an area for which she discovered a passion early in her legal practice. Erica understands the exceptionally difficult emotional, spiritual, and financial challenges often presented by divorce and other domestic relations matters. She works diligently and vigorously to help her clients craft solutions and continue to prioritize their children’s best interests amidst such difficulties. Erica is a certified Guardian Ad Litem for children and is licensed to practice law in both Virginia and Florida. 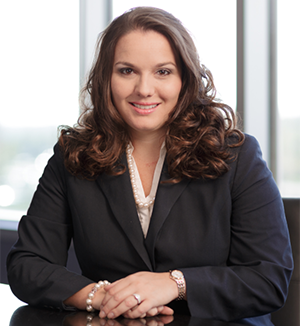 Actively involved in the Richmond legal community, she was named to Virginia Business magazine’s 2014 Legal Elite in the Young Lawyer category. Prior to joining Owen & Owens, Erica served as law clerk to the Honorable Harold W. Burgess, Jr. of the Twelfth Judicial Circuit of Virginia and then as a civil trial lawyer for Morris & Morris in downtown Richmond. Erica earned her J.D. from the University of Richmond School of Law with honors in 2010. During law school, she served as president of the Trial Advocacy Board and as a senior staff member of the University of Richmond Law Review. Erica was an active member of the Moot Court Board and Student Bar Association. She was honored with the “Virginia Trial Lawyers Advocacy Award,” an award presented each year to the graduate who most notably excelled at trial competitions. Erica grew up in the family business, an oceanfront motel owned and operated by her parents for thirty years in Daytona Beach, Florida. Erica graduated from Furman University with honors in 2007, where she majored in political science and communication studies. Erica loves Virginia and exploring its scenic outdoors. She is an avid traveler and has also spent a significant amount of time in Southeast Asia and South Africa. Erica is a competitive ballroom dancer and has taught dance lessons and dance exercise. She is involved in the Richmond fine arts community and recently performed as Sarah in the musical “Company” at the Jewish Community Center. Erica is an active member of Third Presbyterian Church in Henrico and enjoys spending time with her church family. She and her husband Jesse reside in Midlothian. Lectured on “Effectively Arguing Contempt Issues” with the National Business Institute, October, 2016.